Almost every night, right after my baby falls asleep at my breast I look at her, caress her head, bring her closer to me and give her a kiss. My, how things have changed. It took me longer than I wanted to fall madly in love with her, but we are finally here. When you are pregnant you imagine falling in love with your baby the first time you hold them, perhaps even earlier. It happened to me with both my children, but after the reality of parenting set in, I had a hard time bonding with my daughter. I felt embarrassed and guilty even admitting to myself that this was how I felt. I had this absolutely beautiful, peaceful, easy baby that I had very much wanted, and yet I felt detached from her. I was doing what you read you should do: nursing, wearing and enjoying her, yet when she cried I responded to her as if I was responding to a baby I didn’t know, not as if she was my own. I felt responsibility to care for her because she needed me, but I didn’t feel like I loved her. It all started at 18 weeks, when after a positive screening I thought my baby would not make it to term, and if she did, she would pass shortly after birth. It took 3 weeks to get the results of a very accurate test telling us that everything was fine. My worry, however, never left, and preparing for the worst I unconsciously kept a distance from the baby I was carrying. After she was born, I was in heaven. My baby was with us after a 42-week pregnancy and an 8 hour labor. I felt good, strong and ready to mother two children. But just three weeks after her birth we moved across the country. I was busy getting ready for the move, and busy trying to make it work for everyone in the family. My baby, who is the most easy going baby in history, had no trouble sleeping, eating or pooping. I did not have to put any effort into caring for her. She was always content. Meanwhile my not-quite two-year old son seemed to demand more attention than ever before. He is full of life, very funny and tremendously emotional. I noticed how our evening ritual had changed since the arrival of his sister. With her in my arms, he did not want to sit on my lap while I read to him. I found myself putting her down on her crib so I could read to my son. Sometimes I let her cry a little, hoping she would calm down on her own. Often, it was my son who would tell me that the baby was crying, alerting me that I needed to go get her. I realized that I was not attached to my baby. Her cries would not send the same instant reaction as my son’s had. Rocking her for 5 minutes seemed like a long time, when I had spent hours rocking my son. I mentioned my feelings to my sister in passing, she could not believe what I was saying because, as she told me, “you always have her on you.” I did. I was trying to wear her until I felt that incredulous feeling when you think to yourself “how can I love someone so much?” My husband also knew about my bonding issues, and did his best to help me. Otherwise I wanted to hide what was happening because I didn’t want people to judge me. After all, what kind of mother doesn’t fall in love with her child right away? It turns out, it is quite normal. A quick online search turned out several articles on issues with bonding. Having trouble bonding can be a sign of post-partum depression. I had the baby blues, but I know I was not depressed. Bonding with a second child can be especially difficult. Worries about being able to love someone else as much as you love your first, stress and lack of sleep can contribute to bonding issues. Still, I cringed with every facebook post of new moms proclaiming how madly in love with their newborns they were. I judged myself and thought I was a bad mother, or that I had been wrong and didn’t really want, or could care for, another baby. I was on edge, had little patience and was a little sad during what really was a very happy time in my life. Then it happened. One evening as I was rocking her to sleep for what it seemed like a good 20 minutes of on and off crying- something extremely unusual in my baby- I looked at her and saw her pinkish skin, her chubby cheeks, her long eyelashes. I noticed her nose, shaped like mine, and the peach fuzz around her ears. I felt the softness of her skin and the weight of her body on my arms. I was in love. 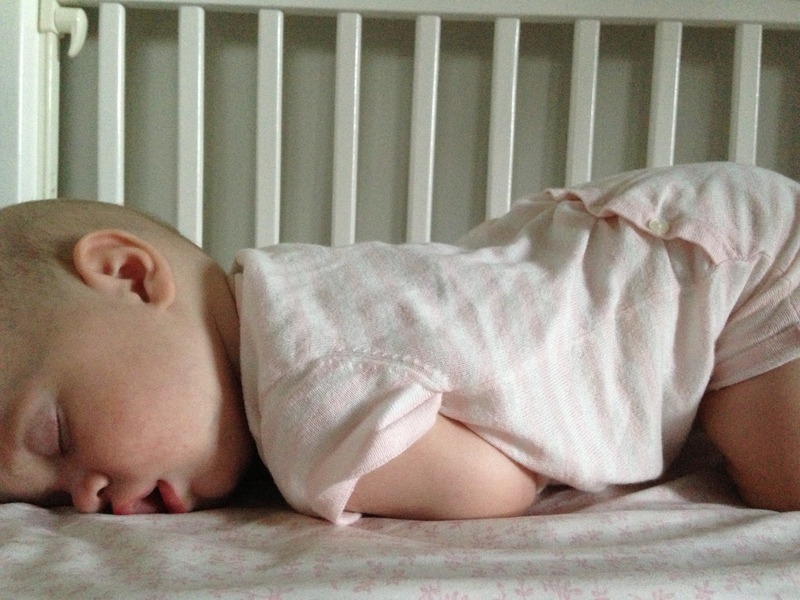 She fell asleep, but I had a hard time putting her back on her crib. I wanted it to be just us for another while, feel the love that I had wanted to feel for so many months. She is 6 months now, and I cannot get enough of my sweet baby. I love how she smiles at me, laughs so hard with her big brother and sleeps peacefully next to me in the morning, when she takes a short nap after her early morning nursing session- too short for me to fall asleep too. What I learned during this struggle is that as mothers, we often put so much weight on what we do and how well it works for us that we judge and hurt others instead of help them when they are struggling. I am a breastfeeding mother, I wear my children, they use cloth diapers and I make more than 95 percent of the food they eat. I held my baby skin-to-skin right after her birth, not letting the nursing staff at the hospital to even bath her. I delivered without pain medication and felt the very natural rush of hormones after delivery. I never thought that bonding issues with my children would be something I would live through, because in my eyes I was doing everything ‘right.’ But I did, and I learned that ‘right’ looks very different from family to family. If you are struggling bonding with your child, or know someone who is, this is what worked for me. Did you fall in love with your children right away? Did you have trouble bonding? I thought it was harder to bond with my second baby, too. I felt so busy with the first that it was hard to find uninterrupted time to really connect with the baby. My kids stagger their naps right now, which gives me a little more one on one time with each. I am really tired, but I enjoy getting to be with them individually. That one on one time is very special. I hope you get some rest soon.